You are here: Home » The Wisdom » The Great Speech » 55-The "Union for the Defence of the Rights of Anatolia and Rumelia"
The “Union for the Defence of the Rights of Anatolia and Ru- melia,” having carefully examined and studied all the above-mentioned possibilities, consider it their duty to inform all the deputies what would happen if they should find it necessary to meet in Constantinople, and to ask each one of them individually to express his opinion on the subject. 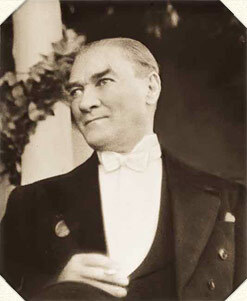 Moreover, we thought it necessary that the honourable deputies, before sitting in the National Assembly in Constantinople, should consider the advisability of meeting in some other town, and with that in view they should first meet at certain places so that they could study the following questions and communicate the result of their deliberations to the Representative Committee. A. If it were found unavoidably necessary to meet in Constan tinople, what measures and dispositions would have to be taken hi that town and throughout the country? B. The possibility to be studied for the formation of a united and determined party in the National Assembly to preserve and protect our aims, namely, to safeguard the integrity of the territory of our country and the independence of our State and Nation. The towns most convenient for the meeting of the deputies who should discuss these questions are, Trebizond, Samsoon, Ineboli, Eski-Shehr, Brusa, Panderma and Adrianople. i. To transmit the contents of the first article to the deputy of your district. As soon as possible to ask him for his personal views, and to communicate them forthwith to the Representative Committee; To bring them likewise to the knowledge of the General Committees, and secure their corresponding co-operation. 2 To assist and protect the meeting of the deputies in the locali ties mentioned in the first article, and to take the necessary steps to bring the result of their discussions to the knowledge of the Represen tative Committee. . . It would be advisable to invite the deputies elected in their own electoral districts, who are at that time in Constantinople, to come to one of the above-mentioned meeting places near Constantinople. * * * I beg you to allow me to mention briefly certain events that took place in October. Ansawur had begun to display his criminal and treacherous activity in the district of Panderma. We wrote to Kiasim Pasha, who was at Balikesri, as well as to other interested persons, urging them energetically to put an end to all these degradations and at the same time to do everything^they could to prevent a number of officers being landed in the district of Kara Bigha and Panderma, for they were members of the “Nikehban” Society. We were also informed that about thirty officers belonging to this society were preparing to land at Trebizond and Samsoon with the object of starting a campaign against the Christians, and thereby bringing forth further interference and occupation by the foreigners. We immediately drew the attention of the XV to Army Corps and the Mutessarif of Djanik to this fact. You know that at the very beginning an English division had occu pied Marash, Urfah and Aintab. These troops were subsequently replaced by French. We tried on that occasion to prevent this new occupation by first taking diplomatic steps and later on, when it was an accomplished fact, by military operations. A new and rather important revolt broke out at Boskir. We tried in different ways to suppress it. Kilidsh Ali Bey was sent to Marash and Aintab, while Kemal Bey, a Major in the Artillery, and Captain Osman Tufan Bey were sent to the district of Cilicia to collect sufficient troops there and enter into action. I now recall an important fact that I would like to mention. The Government had thought it advisable not to consider the request we had sent to them (not to send Zia Pasha) in a favourable light. They confirmed the appointment of that official and insisted that he should take up his duties. But Zia Pasha had not proceeded farther than Eski-Shehr when he returned and went on leave. In cipher. Urgent. Sivas, 3 rd November, 1919. Reply to your telegram in cipher of 2 nd November. No, 501.
i. We have adopted the principle of loyal understanding and real unity in our communications between the Government and the na tional organisation. Through the mediation of Your Excellency we had expressed a very important desire with the object of protecting the national organisations, whose aim is lawful, from any vexatious interference. We demanded that all the higher officials should be elected on these terms and that those who opposed them should be dismissed and replaced by others. We have received no reply to our repeated request regarding this. We do not yet know what has been done about the Valis of Trebizond and Diarbekr, and the Mutessarif of Antalia. On the contrary, without studying the circumstances, the Minister of the Interior has sent Subhi Bey, who is as weak as he is inefficient and who is a member of the Society of the “Friends of England/ as Vali to Konia. The Minister of the Interior has totally ignored questions of this description. This leads us to think that he is following a policy that is antagonistic to the national movement If we are mistaken, we beg you to point out to us where we are in error, so that we may set the matter right in our minds. I had written to tell you that Zia Pasha, the Vali of Angora, had been granted leave at his own request; of course, he is still officially regarded as Vali of Angora But until all doubt on this point has been dispelled, the extension of this Vali s leave may be considered as the most satisfactory solution that could be found. If a man like Nurreddin Bey were to remain in his office as Director of Police in Constantinople, it would suggest that Your Excellency is not inclined to see the importance of this question. Your indifference would have a very bad consequence for the Government, as well as for the national organisation. You will undoubtedly find it quite excusable that the Representative Committee cannot tolerate the slightest thing that could be injurious to the national organisation and the national unity. 2. No communication of any kind has been issued to the Press by the Representative Committee referring to the incident at Boskir. There must be some misunderstanding about this. Possibly the information has been extracted from something that was published in the newspaper called “The National Will.” Your Excellency surely knows that the Representative Committee has not thought it to be their duty to exercise a censorship over any newspaper. We beg you, however, to give us some information about this agency that appears to you to have led to a misunderstanding with the Govern ment, so that we can draw the attention of the persons concerned to it.